Yesterday Stacey had her little girl! Go check out Stacey's update and photos at her blog. Since this is my blog I can tell you all how excited I am. Since Stacey knew as of the end of last week that it would be a C-Section I quickly booked a flight and am going to visit April 2-6th. My in-laws are coming during that time to help Husband (although I'm sure he'd be fine on his own). I'm totally going to call her Cammie and I hope Stacey doesn't hate that. Cammie's cheeks are so adorable. I will go back and update my birth story with photos (since they are all gone thanks to the Evil Empire Who Cannot Be Named Or I Would Lose Ad Revenue) later tonight. Bring Stacey food and water while she feeds Cammie or is resting. I won't insist on feeding Cammie bottles (got to establish some good BFing!) or holding her all the time but I want a sleepy baby nestled into me at least once. Do chores around the house without being asked. Go grocery shopping. Maybe I'll cook but to be honest I'm not much of one. I can dial and wield a credit card though. Maybe I'll make a vat of Lori's special marinara sauce. Change dirty diapers. Change clothes and clean up spit up. Burp. Take photos of baby and family and do a little album for them. Listen to Stacey talk about how wonderful Cammie is; how hard it is to be a mom; or whatever else she wants to talk about. What else should I do to help her? Unless you can figure out a way to shower or sleep for her, i think you've got it covered! 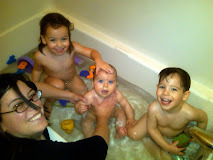 My favorite thing that our houseguests did was help me get out of the house with the babies. It helped to get some confidence that the world would *not* end if my baby (ahem... Nate) screamed bloody murder in Target. I second Laura's comment. I was terrified to leave the house, and it was great when I finally made it outside. Congrats to you, auntie! How fun that you get to go visit right away. As someone who still has vivid memories of the newborn days, I'm sure you'll be an ideal helper. Have fun!! All of the things you wrote are fantastic, but one additional thing that people did for me: if it's nice out, put the baby in the stroller and take her for a walk WITHOUT MOM. It's one thing for a new mom to rest while baby is sleeping, but knowing she could wake up at any moment and start screaming makes it a little hard to relax. If she's out of the house, even just for 20 minutes? Amazingly refreshing. And since baby won't be around strangers, or even out of the stroller, you're not really bringing her "out in public" too soon. -- When she cries unexpectidly, give her a hug and tell her it's completely normal and to let it all out. -- Tell her she's doing an amazing job often, because she'll inevitably think she's not. Tell her she doesn't need to entertain you and can feel free to drop out and sleep at a moment's notice. Congrats to the whole fam! My only advice is don't over do it. Not too much advice, not over the top help. She needs to know that she can depend on herself and on you. Balance. Plus tell her she did a good job...it is always nice for a lady to hear that she did a good job during pregnancy.